If you do not have a clotting agent such as CELOX, you can in fact use simple ground black pepper to stop bleeding quickly for small to medium sized cuts/wounds. Black pepper is naturally antibacterial and makes blood coagulate quickly and stop bleeding. Black pepper was commonly used by soldiers in the Second World War, and even today it is often used in professional kitchens (probably due to its availability) to stop cuts from bleeding. 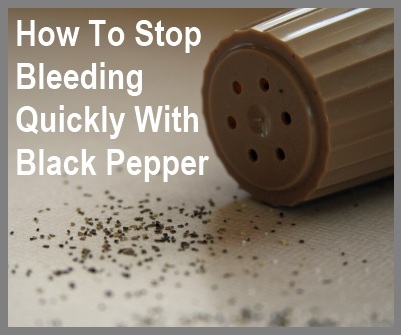 It couldn’t be simpler to use black pepper to stop bleeding – simply pour a generous amount of ground black pepper onto the wound and apply pressure (and bandage if necessary) and it should quickly stop bleeding (please use common sense though as serious cuts may still require the attention of a physician). Note: Finely ground black pepper works best, and no, black pepper does not sting when put on a cut!